Your "down to the earth"...I first thought that that was: "met twee voeten op de grond staan" the equivalent in English is "keep both feet firmly on the ground"
"Two things we discovered one should not feed to laying hens : Beetroot (Beta vulgaris) which turns the white pink, and Shepherd's purse (Capsella bursa-pastoris) which turns the yolk, or specific layers of it green"
At 14 years of age and the youngest of 16 children, an Austrian archduchess blots her copybook quite literally when she signs the marriage certificate cementing her betrothal to the 15 year old French dauphin Louis. She also manages to spell her own name wrong, unused as she is to its French version and never having quite come to terms with words and letters anyway. But then learning and handwriting skills had never been her forte and definitely weren't a prerequisite for the union under way. Most of us shudder at the thought of our parents having done the jiggey pokey thingy, even if we ourselves are proof enough that they must have. 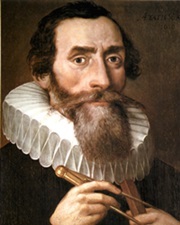 However astronomer Johannes Kepler had no such qualms - indeed he saw it as a straightforward mathematical puzzle which could be resolved with a dollop of astrology, a smattering of astronomy and a thin grasp of physical laws relating to planetary motion. After several pages of calculation he therefore concluded (with a slight margin of error depending on how much influence the moon may have had at the time) that he had been conceived at exactly 4:37am on the morning of May 16th, 1571.
and in 1925, Pol Pot. Pray my Dear, quoth my mother, have you not forgot to wind up the clock?—Good G..! cried my father, making an exclamation, but taking care to moderate his voice at the same time,—Did ever woman, since the creation of the world, interrupt a man with such a silly question? Twenty four hours after the execution of his second wife - after what must be the shortest period of royal mourning in history - Henry VIII was formally betrothed to Jane Seymour. The betrothal was public and before witnesses. The marriage was scheduled to take place in another ten days' time, at the end of May. Even the Imperial ambassador, a man who had loathed Anne Boleyn, was shocked at what appeared to be indecent haste. The London mob was pretty shocked too. Chapuys reported to his master in Spain that "...everybody begins already to murmur by suspicion, and several affirm that long before the death of the other there was some arrangement which sounds ill to the ears of the people..."
So even then Fox News was a little lax with its facts! Quite a few had flown the Atlantic before Lindbergh - and Amelia was reputedly poor at navigation that's supposedly why she had a navigator with her on her final flight. First crossing of the Atlantic by a womanOn 17–18 June 1928, Amelia Earhart was a passenger on an aircraft piloted by Wilmer Stultz. Since most of the flight was on instruments for which Earhart had no training, she did not pilot the aircraft. Interviewed after landing, she said, "Stultz did all the flying — had to. I was just baggage, like a sack of potatoes. Maybe someday I'll try it alone." Lindbergh's flight was for the Orteig Prize of $25,000. Fine. The title of the clip says "First Transatlantic Flight" not "First Solo Non-stop Transatlantic Flight". 22 May 1914 - suffragette Frieda Graham walked into the National Gallery and slashed five paintings, including Giovanni Bellini’s "Agony in the Garden" and Gentile Bellini’s "Portrait of a Mathematician". At the same time in the Royal Academy, Mary Wood, shouting "Votes for women!" took a meat cleaver to a portrait of Henry James by John Singer Sargent. Both women appeared at a police court hearing the following day at which, according to The Times, they "kept up a continual tirade from the prisoner's enclosure and were held fast by two policemen throughout the proceedings". 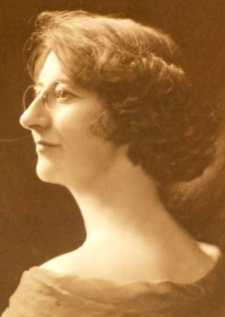 Frieda Graham (what a lovely swan-like neck). On the 23 May another attack was launched, this time on the British Museum. Armed, rather charmingly, with an ornate toffee hammer which was small enough to have been concealed in her handbag, Annie Wheeler smashed the glass case containing an Egyptian mummy. To avoid further damage the National Gallery, Tate Gallery, Royal Academy and the Wallace Collection all closed ‘until further notice’. The British Museum remained open, but announced that in future "women would only be admitted with a ticket issued on receipt of a letter from a person willing to be responsible for their behaviour". And who presumably had to be a man. The suffragette demonstrators were each sentenced to 6 months imprisonment, which was the maximum allowed for destruction of an artwork, but Frieda Graham immediately went on hunger strike and so was released 5 June on health grounds. All the paintings were eventually restored and the mummy had never actually received any damage. By August all the galleries had reopened when, with the start of the WW1, the Women's Social and Political Union had called for an end to all such violent acts, "for the duration of the war". I'm not convinced that such actions didn't discourage and disgust many Suffragists, and thereby delayed obtaining the suffragette's aims. 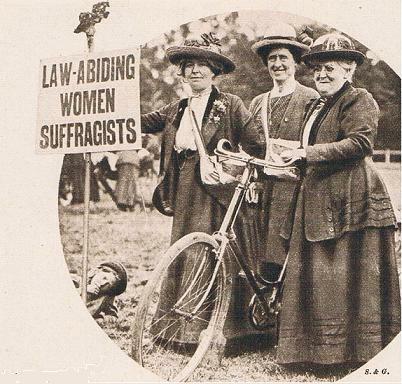 Original caption: "In contra-distinction to the "Millies", as they were half-affectionately, half-contemptuously called, groups of law-abiding suffragettes paraded the country. 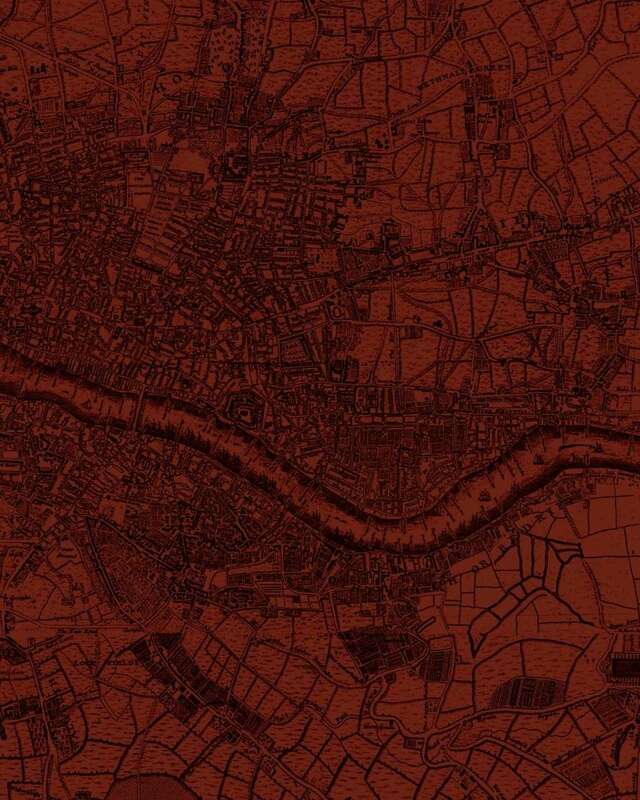 The trio above consisted of Mrs Pemberton, aged forty-five, and Mrs Bildenberg, two Mancunians, who walked to London, and Mrs Mason, then over fifty, who cycled from Bolton." (Pageant of the Century, for 1913). Ah a Dis-accordion. I once found one in our attic - we all had such noisy fun with it but then it disappeared. Mother said she sent it off for the war effort - that has always puzzled me! She must have REALLY hated the Germans! It is May 27th 1937 and a week of celebrations kicks off to mark the opening of one of the most iconic bridges in the world. Among the bridge's many record-setting attributes is one notable, if not exactly welcome, statistic - it is the world's second most popular site for suicides. The city no longer provides an official count (when it did so a local radio station offered a case of Snapple fruit juice in 1995 to the family of the 1,000th "jumper") though unofficially it surpassed 1,600 in 2012 and the rate is actually increasing with roughly one suicide or would-be suicide incident every other day. 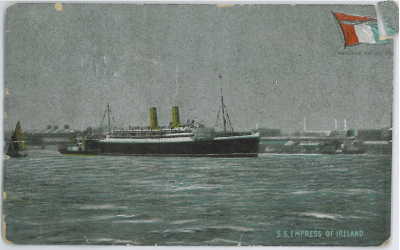 29 May 1914, the liner Empress of Ireland sinks after a colloision in the Gulf of St Lawrence, with the loss of over 1,000 passengers and crew. Female outlaw, Pearl Hart, takes part in a stagecoach robbery in Arizona. 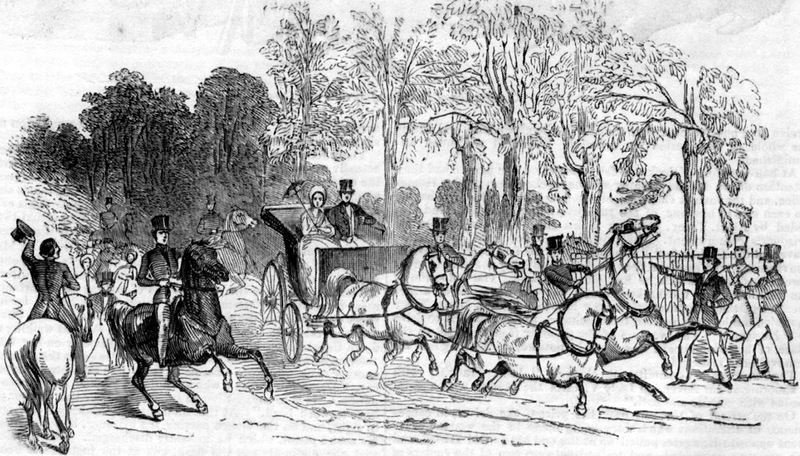 May 30th 1842 - unemployed 19-year-old carpenter John (James) Francis, having been foiled in an almost identical attempt the day before, takes a pot-shot at her majesty Queen Victoria, then only five years into her reign, as she and her husband Prince Albert rode in an open carriage up Constitution Hill towards Buckingham Palace. Albert had spotted his abortive attempt the day before and alerted the police, and he and Vickie agreed with their cunning plan to get the assassin to show his hand again by making themselves sitting ducks in broad daylight in so vulnerable a place and means of locomotion. In 1842 this was called "police intelligence" (and the phrase has hardly altered its meaning since then either). Francis's plan failed, but only just. The picture from the Illustrated News may not be quite accurate, but it does show the peeler idly standing by as the Welshman took aim. This was because the constable, PC William Trounce, even though fully aware of the youth with the firearm right beside him, chose instead of wrestling with him to show proper respect and take the time to dutifully salute his sovereign as she went by. Luckily for him, and for the queen, Francis was a lousy shot. This was not the first such attempt on Victoria's life and nor was it the last. Two years beforehand, also amazingly on Constitution Hill, an unemployed barman Edward Oxford (who thought he really should have been an admiral and was peeved that no one shared his view), fired at her from point blank range with two duelling pistols and still managed to miss. A month after the Francis attack a hunch-backed dwarf called Willie Bean also had a pop at her (the gun misfired). He actually managed to escape though the police, using clever detection work (ie. by arresting every hunch-backed dwarf in London) managed to flush him out. It had been remiss of Bean to make his attempt at another venue than Constitution Hill. In 1849 however an unemployed Irish bricklayer William Hamilton, rectified this departure from regicidal protocol and managed to fire at Victoria just as her carriage reached the top of the hill. So wild was his shot however that the authorities concluded he had been aiming to miss and his sentence of seven years hard labour followed by deportation at least allowed him to live out the rest of his natural in Western Australia, no doubt impressing Perthians with his tale of how close he once had come to nobbling a noble. A year later Robert Pate was not to be so gentlemanly. He chose Piccadilly as his venue and instead of a gun decided he would be content with simply thrashing the queen with his cane. He managed to land one blow, blackening the royal eye, before he too was apprehended. He also ended up in Australia on a deportation order - making one wonder if he and Hamilton ever ran into one another and reminisced about their old regicidal days together. Two more attacks were to follow. Arthur O'Connor (great nephew of the chartist Fergus O'Connor) returned to more orthodox firearms in his own attempt, this time the assailant being thwarted by the queen's trusty gillie John Brown (we'll leave that one stand as it is). O'Connor ended up - where else but - transported to Australia, where we must now imagine the locals in the Perth pub must have been bored silly by yet another geriatric regicide in their midst recounting past glories in the long years that followed. Then, in 1882, came the final - and potentially most dangerous - attempt yet. Roderick Maclean - a man who believed the colour blue and number 4 were magically telling him what to do - heeded these nebulous voices and waylaid Her Madge in Windsor as she rode from the train station to her humble abode there. He'd planned four shots but managed only one before being wrestled to the ground. The one shot however embedded itself in the carriage by Victoria's head having grazed her scalp en route. To Victoria's disgust Maclean was acquitted on the grounds of insanity, though to her relief was never apparently so insane again as to try his luck another time. This of course could well have been to do with the fact that he spent the remainder of his days in Broadmoor Insane Asylum. (I'm surprised Temp hasn't beaten me to this one). 30 May 1593 - Christopher Marlowe, possibly a spy working for Thomas Walsingham, but certainly an accomplished poet and dramatist, is stabbed to death under unresolved and rather mysterious circumstances, but seemingly at the hand of a colleague, one Ingram Frizer. 1585 portrait of an unknown man - but generally presumed to be Christopher Marlowe. The "complete" details of Marlowe's killing are contained in the inquest report of the Coroner of the Queen's Household from the 1st June 1593. According to this report, based upon accounts from the three men present, Poley, Frizer, Skeres and Marlowe were in a private room in Eleanor Bull's victualling house, where they had just had dinner. Poley, Frizer and Skeres were all seated facing a table with Frizer in the middle. Marlowe was lounging on a bed just behind them when Frizer and he got into an argument over "the reckyninge" (the bill). Marlowe suddenly jumped up, seized Frizer's dagger, which Frizer was wearing "at his back", and with it struck him twice on the head, leaving wounds two inches long and a quarter deep. Frizer, his freedom of movement restricted between Poley and Skeres, struggled to defend himself and in doing so stabbed Marlowe above the right eye, killing him immediately. Frizer was found by the inquest jury to be not guilty of murder for reasons of self defence and on 28 June the Queen granted him a formal pardon. But given the murky world of government intelligence gathering that all four men were almost certainly involved in, probably the best that anyone can still come up with is that he died in "unresolved circumstances". The Vandal fleet was based in Carthage, historical karma for the Third Punic War. Quite a lot of ironies there ... a descendant of Napoleon Bonaparte dies whilst serving in the British army, helping to build a British Empire in rivalry with the French; he's the last hereditary claimant to an anti-monarchist, republican "throne"; and whilst having sworn allegiance to the British queen he still said he remained French to the core. A man's man, he is only allowed to accompany his fellow officers into action because of the intervention of his politically connected mother who is able to persuade Queen Victoria to give her permission, but still only on condition that he is, "not to do anything rash and to avoid running unnecessary risks". And he then gets himself killed in a minor skirmish with native tribesmen ... armed with a revolver and Martini-Henry rifle, he is stabbed at close quarters with a spear! PS : It is also worth noting that conspiracy theories are nothing new. Following Louis Napoleon's death there were immediately rumours throughout Europe and America that the prince had been intentionally "disposed of" by the British, or alternatively by French republicans in league with Freemasons. In one widely circulated French account, Queen Victoria herself was personally accused of arranging the whole thing, a theory that was later dramatised in a play "Napoleon IV", by Maurice Rostand. PPS : General Garnet Wolseley's comment on learning of his death was: ..."a plucky young man, and he died a soldier's death. What on earth could he have done better?". PPPS : Prince Eugène took with him to South Africa the sword that was carried by the first Napolèon Bonaparte at the Battle of Austerlitz in 1805. The prince apparently often wore it in preference to his standard British, army-issue, sabre .... I wonder if he had it with him at his final, fatal encounter? June 3rd 1643 was a black day for the sisters and fools of St Bartholomew's Hospital in London. St Bartholomew's (or "Bart's") is one of the oldest hospitals in continual existence to be found on the planet and almost as much of its rich history has been lost to the vagaries of time as has survived, among these losses alas being just who these "fools" might have been though it appears from the context in which they are mentioned in the ancient records that they were what today might be called novice or trainee nurses. A record of Bart's employing female nursing staff had started in the reign of King John under the stewardship of Edeva, daughter of Wakerilda of Writele, who styled herself a nun without apparently having taken full holy orders. Edeva had previously been a servant to the unfortunately named William Bocuinte who we know from city records granted her at one point the not inconsiderable sum of ten shillings a year in the form of rent from various premises he owned. One condition named was that this rent would then be paid to St Bartholomew's should Edeva take up a position there so it seems such a career move was already on the cards. Edeva did indeed move to Bart's but whatever holy orders she took were not the standard ones. For a start she was free to choose her own uniform and settled on that of the Augustinian friars' novices - a white tunic, robe and head covering. She insisted however that all her staff, regardless of whether they had taken orders or not, be termed "sisters" anyway. One of her successors decided that the senior sister should also be termed "matron" (to avoid confusion with an abbess, mother superior or prioress who would only have those under orders in her charge). The white uniform as well as the terms "sister" and "matron" have now become standard throughout the entire nursing profession. The "fool" however has not. This term was changed to the only slightly less unflattering "innocent" in later centuries but was still in use when, in 1559, the authorities in St Bart's decided that one of the matron's duties - the brewing and selling of beer - was leading to situations where the good sisters and fools were benefitting rather conspicuously from this trade. 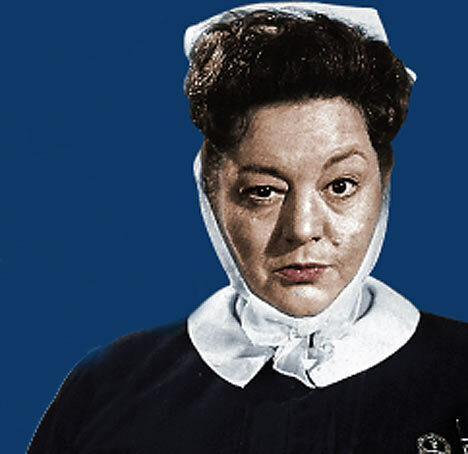 In a move that smacks more of professional jealousy than consideration for the hospital's economic well-being (the beer was essentially a great little fund-raiser for the establishment) they forbade the sale of beer by matron from that point on. But her beer must have been good stuff as they didn't stop the brewing, which is where June 3rd 1643 comes into it. In 1643 England was then in its second year of outright and bloody civil war. The king was still on his throne but the secular authorities, especially in London, were slowly but surely going over to the parliamentarian side. With this switch in allegiance often came a rather swingeing dose of puritanism too and the powers that be in Bart's were seemingly not immune to this malevolent and joyless zeitgeist either. Matron's brew, by now a four hundred year old staple of both staff and patients, came under the scrutiny of the puritanical board who actually went to the extent of getting a Court Order to ban "tippling in the matron's cellar" from that day forth. Even worse, her equipment was confiscated and destroyed. Matron's cellar was of course out of bounds for males which might perhaps explain at least some of the mean-minded pettiness behind this ordinance. Getting the good sisters (and fools) off the sauce however turned out to be a good thing. Two years later in a direct response to having to tend the many casualties from the Battle of Naseby the female nurses were finally permitted to exceed in number the male staff. By the end of the century this had grown to a hundred "sisters" and an unknown number of "innocents" aiding them, which brought in its wake other reforms and improvements regarding their allowance and pay, their education and their professionalism. One result of this increase in organisation and power came in 1669 when the matron, in defiance of her superiors, ordered that the patients' beer ration be restored. Scurvy Grass ale, brewed locally, became the standard at Bart's from this point on and lasted well into the Victorian era. There is no mention of any board members having the neck to complain this time! Emily Davison either commits suicide or, as most people now believe, dies in a vain attempt to pin a sugragette flag or sash to the king's horse Anmer at the Epsom Derby. Although one of the most famous incidents to occur during the women's campaign for the right of suffrage she supported there was considerable controversy then and even now as to whether her action advanced or damaged the cause. She was to die a few days later from her injuries. Herbert Jones, Anmer's jockey, laid a wreath for her and Emmaline Pankhurst at the funeral of the latter in 1928. In 1951, depressed after the death of his own wife, he gassed himself to death in his kitchen. Like MM, I've been moved by it all - the bagpipes playing Auld Lang Syne just now have finished me off. 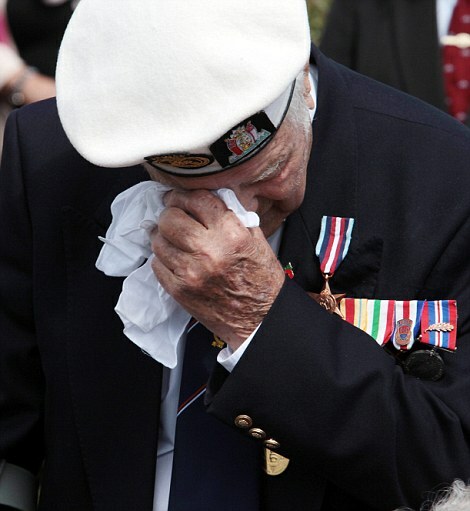 I for one would like to say thank you to them all. We of the Health and Safety generations really have no idea. I've seen and heard parts of this during the day and it was affecting but, much though it pains me to admit it, as ever I found the familiar old words and music deeply moving. It's prompted me to ponder - without the KJV and the great old hymns and psalms, what words and music could we use that would have the same impact? It's that blooming cultural Christianity again, it's so deeply embedded that it's almost impossible to imagine an alternative that would have the same resonances and blend of solemnity and nostalgia. However, I had to switch off Obama as my craw was rising. Didn't his speech feel so inappropriate somehow? It was just so, well, American. A bit like this, which I heard on the radio for the very first time today. Glaswegian architect and designer Charles Rennie Mackintosh was born on 7th June 1868, though he was much more than that. Sadly some of his works perished in the recent Glasgow Art School fire though some of the "Mackintosh" building was saved by firefighters. Bad weather in the "year without a summer" has forced five young tourists, staying at the Villa Diodati by Lake Geneva in Switzerland, to remain indoors for an entire day. As evening approaches, the eldest among them, 28 year old George, amuses his companions by reading from a recently published French anthology of German ghost stories, "Fantasmagoriana". George, already a published author of some repute, reckons he could compose something equally horrific if he set his mind to it and this thought once expressed quickly becomes a challenge to all present to do likewise. George himself produces a poem, "Darkness", that very night. 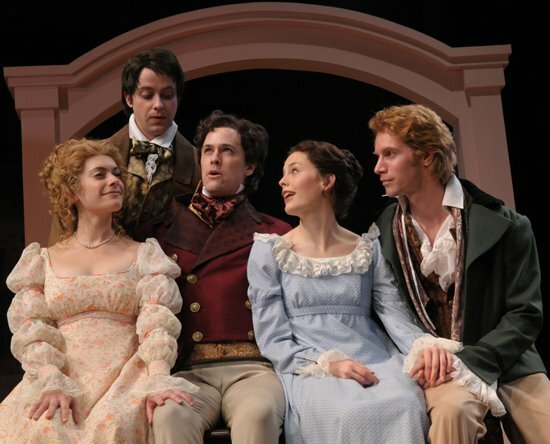 18 year old Jane, pregnant with George's baby and on the run from her family, has other things on her mind it seems and, despite fancying herself as his literary protégé (though George himself was growing to hate her as clingy and pretentious) passes up on the challenge. John, who at 19 has already qualified in medicine and is travelling as George's personal physician (George has several ailments ranging from congenital talipes equinovarus to bipolarism, all of which John treats with opium), retires to his room and begins work on what would later be called "The Vampyre", the book that would introduce this standard of horror fiction to a wide audience and inspire Bram Stoker's later "Dracula". However it is Jane's companion Mary who will eventually win this challenge outright, and how! At 19 years of age she is travelling in the group as mistress of a young married poet also present this fateful day. Percy, the poet, declines the challenge, preferring his works to reflect a less gloomy aspect to life. However the dreary and dark summer (a result of the eruption of Mount Tambora in the East Indies whose ash has cast a veil over most of the globe for months), as well as the recent death of her first child, a baby daughter born prematurely who had struggled to live for three weeks while both potential fathers declined to visit her or the baby, must have made young Mary especially amenable to gloomy thoughts. Her young life, after all, has already becoming depressingly complicated and tinged with its own terrors. Being the one person of the four who as yet has never displayed literary pretensions of her own she nevertheless that night begins writing a tale which would surpass her companions' for its horror, its depth, its appeal and ultimately its claim to be recognised as one of the most iconic and influential horror-genre classics ever. "Frankenstein, the Modern Prometheus" is born. Staying with the literary theme, 16 June 1904, is the day selected by James Joyce for the adventures of Leopold Bloom in his novel Ulysses. 16 June is celebrated in Dublin as "Bloomsday"
Joyce chose that date for Bloomsday because it was the date he first went out on a walk with Nora Barnacle, later Mrs. James Joyce, aka Molly Bloom. She later commented that she thought her husband was probably a genius, but that he had "a dirty mind". Virginia Woolf (not Joyce's sort of woman at all, I shouldn't have have thought) was a bit more scathing about the genius's work - queasy undergraduate scratching his pimples and all. But VW may just have been jealous. Two young Cambridge intellectuals chose Bloomsday - June 16th 1956 - as their wedding day. I wanted to put that the Furies must have been hovering close that hot, bright June morning in London, but actually it was raining when Ted Hughes married Sylvia Plath at St. George the Martyr Holborn. It was a marriage that led, one way or another, to the despair and suicide of three people: Plath killed herself in 1963; Assia Wevill, Hughes's mistress, also gassed herself in 1969, taking her little girl, Hughes's child, with her. Sylvia and Ted's son, Nicholas, hanged himself in 2009. It's probably just as well we have no inkling of our future: had Hughes known what lay ahead he probably would have run a mile that June morning. Plath no doubt would still have gone ahead and made her vows. Gwyneth Paltrow and Daniel Craig as Plath and Hughes.